It's a dual-core, 4G LTE speedster – but where's the wow factor? Can the Droid Bionic compete with other Motorola phones? A very capable phone that feels a little utilitarian when compared to other phones in the Motorola line. 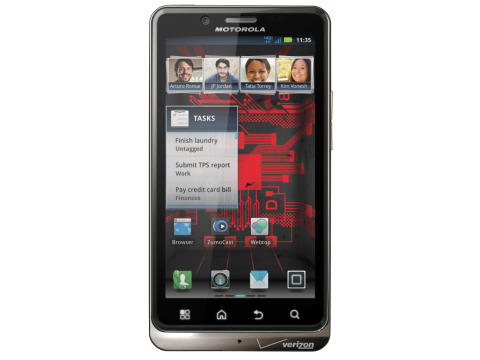 The Droid Bionic was Motorola's first dual-core (at 1GHz) handset to use Verizon's 4G LTE network, though it's since been joined by the Droid Razr and will soon be joined by its newer, much longer-lasting sibling, the Droid Razr Maxx. Similar in stature to the earlier Droid X models, the Droid Bionic features a relatively slim profile with a small bulge on the backside for the 8MP auto-focus camera with 1080p HD video recording. However, instead of physical buttons below the display, the Droid Bionic features permanent touch buttons that respond only when the screen is on. At 4.3-inch, the Gorilla Glass-shielded qHD display – which comes in at a resolution of 960x540 – is just barely larger than those of the Samsung Galaxy Nexus and Galaxy S2, and it's a bright and attractive screen that's accentuated by the little light flourishes seen on Motorola's widgets as you flip through the home screens. The Droid Bionic runs Android 2.3.4 (Gingerbread), and while Motorola has promised an eventual update to 4.0 (Ice Cream Sandwich), a timeline has yet to be announced. Though the device has a little heft to it at 159g (5.6 oz), its form factor feels good in the hand, thanks to a lightly textured plastic back panel and the upwards slant that gives it a bit of a grip to hold onto. Unfortunately, the back panel is a pain to yank off; a small slat for fingertips is found right behind the physical power button, but we ended up using a credit card to pry it off after feeling like we might snap the thing in half any other way. Because the back panel utilizes a seemingly cheaper and more flexible piece of plastic than elsewhere on the device, the overall build quality on the Droid Bionic is slightly less impressive than desired. The light creaking sound heard when squeezing the bottom half of the phone is oddly off-putting considering how slick and refined the phone's face seems. Prying open the back shield reveals the 1735 mAh battery, which blocks access to the SIM card. However, you won't need to remove the battery to access and remove the MicroSD card – the Droid Bionic comes with a 16GB card in addition to 16GB of on-board storage. In addition to the aforementioned features, you'll find a 3.5mm headphone jack on the top, a volume rocker on the upper right side of the phone, a speaker grate on the lower back, and mini-USB and Micro HD ports in tandem on the lower left side. The Micro HD port can be used to mirror content from the phone to an external HD display in 1080p. Additionally, the phone features a front-facing camera to the left of the Motorola logo above the display, while a small light on the upper right blinks when a notification is available. The Droid Bionic originally launched at a price of $299.99 with a two-year contract from Verizon, or $589.99 for the standalone device. While the contract-free price remains intact, the phone is now sold for $149.99 with an agreement, and we've recently seen it as low as $29.99 with the two-year contract.